All songs recorded by Strafe F.R. in 2017 at STRAFE Studio, Düsseldorf, Germany. Thanks to Detlef Klepsch for technical support and for helping with the mix down. From their early connection with the local punk and new wave scene, centred around the Ratinger Hof in Düsseldorf, Strafe went on to develop a unique and influential form of sound sculpture that pioneered the use of field recordings alongside home-made instruments and the use of the studio as a performance space. 1. We have a piano that is somehow completely bare-boned as if a butcher had been at work. The piano is lying on its back – we can climb into its corpse. The piano strings are easy to access and we prepare them with anything that influences a possible recording. Loudspeakers are installed. Inside the piano we play bass and guitar to use the resonance of the strings of the piano. Pianosmoke was recorded in this way. all of a sudden the machine developed a strange malfunction: the Uher had problems with its engine. Himmelgeist was born. The recorder began to ‘scratch’ like a vinyl record, but it was the recorder doing everything itself; we could also manipulate the speed with our hands. This was magnificent. Strange rhythms just happened, the tape recorder did it... We are thankful that we managed to record all of this. 3. We often amplify sounds quite loudly, that actually have a very low natural dynamic. This is interesting when recording guitar, piano and the human voice... To reduce the normal recording level by an extreme and amplify the soft, low sounds. The helicopters belonging to German army are in a desperate condition. However, the poor maintenance of the machines has unleashed a fantastic new sound. The same way that Prometheus’s liver is renewed and grows again each night, happens also to the Zeitgeist. Because of this, we must continue to work on the music. We cannot stop and will never finish. 5.5 - Veteran sound creators Strafe F.R ("Strafe Für Rebellion") have existed since 1979, with a sporadic release pattern. Their music exists on the boundary between industrial and musique concrete/avant-garde. The Bird Was Stolen is their first album since Sulphur Spring in 2014. This is my first exposure to the group's music. The album has the rapid, gestural quality of musique concrete, in the sense that there is a series of sounds in succession rather than any kind of meter. Many brief glimpses appear and quickly go, possessing unique timbres and brief melodic ideas. 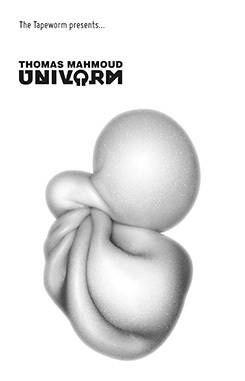 This fragmentary structure is also used in Nurse With Wound's most haunted classic works, Homotopy to Marie or Spiral Insana, one of the closest comparisons to the sound of this album. Generally, The Bird Was Stolen feels more live and filled with punky aggression than NWW's solitary studio creations, and denser with sonic activity. While there is no conventional guitar playing per se, grimy swells of amplifier distortion are used to sketch dim nocturnal and subterranean environments. Clearly doom metal influenced tones date this as a current creation amidst the call-backs to vintage industrial music. Several of the tracks feature emphatic, theatrical narrations with heavy effects processing. It is a rare, more ambient flavour of 'power electronics' as created by Coil. It is not unlike some of the more abstract improvisations by Throbbing Gristle (such as "Kreeme Horne"); in the way it will sway and bob in marshy disrepair, movements heat-addled and lazy, only for the calm to be punctured now and again by a distorted wail. The texture is unmistakably analogue, from the beefy low-mids of the gated noise oscillators in "Pianosmoke", to the various examples of tape looping/manipulation and dub delay. This group has been especially inventive and focused with these vintage techniques and machines. The modular synth work has a particular visionary impact, particularly in the secound half of the album with songs like "Medusa". As a huge fan of Coil and albums like Worship the Glitch, this album feels like a lost work from the past, and it's wonderful to hear quality new music being created in this niche. Long-running German duo Strafe F.R. has been at it since way back in ’79 and The Bird Was Stolen is their first recording on Touch since four releases between the 80’s and early 90’s. Next week (5/24) Bernd Kastner and Siegfried Michail Syniuga unveil this new album in an edition of 500 on CD (and Digital) with fourteen tracks, and a running time of just over an hour. As Jovian Tempest opens we enter a bit of a sacred and mysterious space. What sounds like radio channeling pairs well with other frequencies and effects. It’s definitely in a gray area and I recommend that you may want to listen in the dark. Indistinguishable field recordings of moving elements are embedded with exquisite corpse harmonies on Prepper’s Home where rhythmic percussion rises into the mix. It’s warming and pent up until a remodeled voice emerges on Aconite accompanied by charged guitar and fiery electronics. Strafe F.R.’s second album since returning from a 20-year hiatus is an exercise in contradictions. Truly experimental, it provides us with 14 unique and hard-to-read environments of metallic noises, heavy filters and tape effects, heavily gated guitar and guitar-like noises, pulses and processing- then crashes into them to various degrees with percussive surprises that are sometimes harsh and unpleasant, sometimes quirky bordering on comical. Even the press release skips from talking about vanilla fudge in coconut trees and finding Liszt sleeping inside a piano to the devoured liver of Prometheus. It’s one of those “really don’t know what’s going to happen next” releases, exemplified by the sudden appearance of heavily processed vocal on “Aconite” with a lyric in which the album title is found. But among the wilful surprises, there’s a rich depth to be found here as well. Though constructed from unorthodox parts, “Prepper’s Home” is a fascinating bit of electronica with a truly emotive undercurrent that suddenly breaks into almost Krupa-esque jazz rhythms in its second half. “Pianosmoke”, built from an experiment in playing bass and guitar sounds through a loudspeaker inside a piano in order to stimulate the resonance of the piano, ends up being a very coherent and melodic work that with the right electronica remixes would have a lot of crossover appeal, while other pieces like “Flare”, though built of similar stock, have a darker layout and a more spontaneous and theatrical flavour. “Violet Sun” is a good example of a sparser approach, in which the processed guitar evokes feelings of some sort of alien road movie, while final track “Towton” throws furthest back towards the band’s 80’s roots with some very analogue, fuzzy tape flavours and Nina Hagen-ish vocal wails, right down to its abrupt halting end. Depuis maintenant presque 40 ans, Strafe F.R. 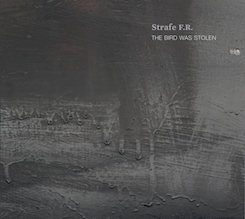 (Strafe Für Rebellion) composé par Bernd Kastner et Siegfried Michail Syniuga, produit une musique faite d’accidents et de manipulations sonores, où field recordings et assemblages instrumentaux forment un ensemble singulier, qui doit autant à Throbbing Gristle qu’à Cabaret Voltaire. The Bird Was Stolen marque le grand retour du duo qui n’avait plus rien sorti depuis 2013. Manipulant les effets et les prises de son, jouant sur l’acoustique et l’espace, Strafe F.R. nous perd dans son dédale aux résonances dub et grisaille industrielle, développant des paysages dévastés par une pandémie aux effets contaminants. On est littéralement happé par le magma de matières traitées au vitriol, qui voit les pianos s’écorcher sur des rainures noise aux mouvements surréalistes. Les couches se multiplient et se superposent, pour donner naissance à des ambiances sombres, enchainées à des mouvements aléatoires à la complexité concentrique. Alles begann mit einem Adler, heißt es. Der aß von der Leber des Prometheus, der an eine Felswand des Kaukasus gekettet wurde, weil er den Menschen das Feuer gebracht hat – was ihm strikt verboten war ... So die Legende des ersten Rebellen, dessen Strafe das Anketten war. Und schon sind wir beim Thema. STRAFE FÜR REBELLION, beziehungsweise STRAFE F.R. heißt dieses lang bestehende Projekt aus Düsseldorf, das bereits 1979 von BERND KASTNER und SIEGFRIED M. SYNIUGA gegründet wurde. Ihre erste selbstbetitelte LP, der eine 7inch beigelegt war, erschien 1982. Viel Beachtung wurde ihr aber leider nicht zuteil. Obwohl doch die 1980er- und 1990er-Jahre durchaus produktiv waren. Dann kam die Pause. Sie dauerte etwa zehn Jahre. Erst 2014 knüpfte STRAFE F.R. an das Musikalische der vergangenen Jahrzehnte an. Doch nun gibt es mit "The Bird Was Stolen" eine brandneue, auf 500 Stück limitierte und auf dem Label TOUCH herausgegebene CD. Man merkt sofort, dass die Musik nicht – wie mittlerweile üblich – auf digitalem Weg produziert wurde. Das wurde sie nie. STRAFE F.R. nutzt keine elektronischen Musikinstrumente. Es werden ausschließlich herkömmliche oder – positiver ausgedrückt – klassische Instrumente wie Klavier, Gitarre, Bass verwendet, die dann allerdings präpariert oder zweckentfremdet eingesetzt werden. Dazu haben KASTNER und SYNIUGA, die übrigens auch als bildende Künstler tätig sind, eigene Instrumente und Geräuschmaschinen gebaut. Diese werden dann auch schon mal ins Wasser gehalten, um die so entstehenden Töne mit einem portablen Tape-Recorder aufzunehmen. Das Ganze wandert schließlich in ein Archiv. Man weiß ja nie, wann und wo ein Sound noch eingesetzt werden kann. Beim Hören der neuen CD fallen gerade die Sounds auch ins Ohr. Sie sind gleichermaßen alt, retro und neu. Mit etwas musikhistorischem Hintergrund erinnert die Soundkulisse an die EINSTÜRZENDEN NEUBAUTEN der frühen 1980er-Jahre oder an DAS SYNTHETISCHE MISCHGEWEBE. Auch bei diesen wurden Instrumente verwendet, die zweckentfremdet zum Einsatz kamen. Auch bauten sie sich ihre eigenen Klangerzeuger, beziehungsweise wurden artfremde Geräte zu Instrumenten umfunktioniert. Allerdings war und ist die Herangehensweise dieser beispielhaft genannten Formationen bis heute höchst eigen. Und ein direkter Vergleich führt in die Sackgasse. Jedoch hilft ein indirekter dabei, sich in etwa vorstellen zu können, in welche Richtung diese Veröffentlichung zeigt. STRAFE F.R. baut zum Beispiel auf musikalische Unfälle, die dann als Quelle für die Aufnahmen ins Spiel gebracht werden. Sie nutzen das Studio dann auch eher als eine Art Grundstück, um sich darauf auszuprobieren, oder als abschließbaren Raum, um darin ungestört Ideen umzusetzen. Sie gehen also nicht in Schwimmbäder oder unter Autobahnbrücken. Sie gehen vielmehr in Klausur. Es entstehen durch Arbeit stark entfremdete Sounds, die nichts mehr mit der eigentlichen Klangqualität gemein haben. In "The Bird Was Stolen" sägen Gitarren, klappern metallisch klingende Gegenstände, wabern unzählige Fäden, die zeitlich immer weiter ausfransen. Auf „Pepper´s Home“ (02) etwa ein Schlagwerk, das sich wie von einer defekten Maschine gespielt anhört, die auf wundersame Weise jedoch noch den Takt halten kann. Und Flächen, die hier und da wie Schollen vom Grund und Boden abbrechen. „Aconite“ (03) steht ebenfalls stellvertretend für diesen speziellen STRAFE F.R.-Sound. Dazu dann die Stimmen, die früher schon mal von eigens engagierten Opernsängern kamen und hier meist an verzerrte, nicht menschliche Stimmen erinnern. In „Anophelis“ (04) klingt das wie in Wasser gesungen. Dazu Störlaute, Brummen, Kratzen. Fehlfunktionen und Feldaufnahmen. Tierlaute und Klangereignisse, die ob des besonderen Ortes, an dem sie aufgenommen wurden, auch besonders klingen. Was geschieht – und was nicht alles geschehen kann – wenn der Gefiederte geklaut wird, veranschaulichen Bernd Kastner und Siegfried M. Syniuga auch im annähernd vierzigsten Jahr ihrer Kollaboration. Zwar scheint ein Tanzflächenfüller nach Art von Hochofenballet (anno 1984) nicht zu den Folgen besagten Diebstahls zu gehören. Doch der geistige Elan, mit dem auf The Bird Was Stolen (Touch/Kudos) die Verwertbarkeit an sich ruinierter Instrumente oder dysfunktional orientierter Aufzeichnungstechnik abgefedert wird, mag zum neuerlichen Nestbau der Synapsen beflügeln. Exactly as it happens with their bizarre and unpredictable output, several mental doors opened up when I saw that Strafe F.R. had released a new album following an extended hiatus. First came the recollection of a long-distance interview that we had carried out (via snail mail!) during my early days as a music writer, this reviewer’s half 90s rants limited to the restricted audience of an Italian quarterly. Then, the realization that nothing has changed: in fact, the same impossibility of classifying the astonishing upshots of Bernd Kastner and S. M. Syniuga’s studio wizardry accompanied the inaugural spins of The Bird Was Stolen. All of the above turned into a classic “OK, let’s go to work for real” type of approach, which is the only requirement for a decent comprehension of the duo’s universe. The name may translate as “punishment for rebellion”, yet Strafe’s electroacoustic visions are never really “punishing” for a listener. Rebellious, maybe – but in a subtly enticing way. The incredible diversity of situations presented in these fourteen tracks is balanced by perfect dosages of compositional seriousness and somewhat sinister humor. Standing still in one or few places is unfeasible for Kastner and Syniuga; they definitely prefer fleeting hints, occasionally synthesizing vivid details and tactile timbres in a single minute’s capsule. Stylistic crystals are thoroughly shattered in about ten seconds: lunatic songs chained to odd-metered sequences, alien reverberations enhanced by awkward superimpositions of feedbacking melodies, “traditional” instruments alternated with sources of unidentified origin, filtered voices uttering incomprehensible messages. You can even try and memorize short snippets of what is heard; however, that memorization will last until the next instant. Kryptische Botschaften aus einer dunklen Moderne sendet das Düsseldorfer Duo Strafe Für Rebellion (bzw. Strafe F.R.) seit vierzig Jahren. Sie sind seither kontinuierlich aktiv, obwohl in ihrem Veröffentlichungskatalog eine fast zwanzigjährige Pause klafft. Seit kurzem mehren sich die Lebenszeichen jedoch wieder und mit The Bird Was Stolen (Touch) geben sie nach all der verlorenen Zeit ein ziemlich definitives Statement ab, dass die verschiedenen Phasen ihres experimentellen und jegliche Formatierung scheuenden Wirkens Revue passieren lässt und nahtlos weiterführt. Das Album sammelt vorwiegend filmisch dräuenden Dark Ambient mit aggressiven und disruptiven Sounds, aber auch avantgardistische Sound-Collagen mit eingefrorenen Industrial-Beats und -Dubs. Attivo dal 1979 (con una pausa produttiva da metà anni novanta sino al 2014), il duo Strafe F. R. (abbreviazione del più esteso Strafe Für Rebellion) formato da Bernd Kastner e Sigfried Michail Syniuga, torna a farsi sentire con quest'ottimo “The Bird Was Stolen” che segue il loro ritorno sulle scene “Sulphur Spring”. Un suono alieno di questi tempi, che raschia e ingloba ruggini, lamiere, distorsioni, voci e vocine (spappolate, tritate e stirate), ritmi sghembi e strumentazione homemade, fiati e sfiati, corde in azione trasfigurante, registrazioni d'ambiente, nastri e un certosino lavoro di taglia e cuci in fase post. Materia ondivaga che inquieta e non s'addomestica come carta da parati acustica. Ci sono parecchie nevrosi urbane diluite su sfondo/collage ballardiano in “The Bird Was Stolen”. Stridenti rotative ingrippate/dialoganti e notevoli intestardimenti ritmici. Apron delle porte che probabilmente non interesseranno più a molti, ma attenzione, perché il colpo d'occhio offerto, è unico nel suo genere (quasi da sacred music tipo Factrix per intenderci, ma con minor tasso ansiogeno). Dusseldorf combo Strafe Für Rebellion started life in the late 1970s as the duo of Bernd Kastner and Siegfried Michail Syniuga, who made a series of records under that name for Soleilmoon, Staalplaat, and Touch. I never studied any of their 1980s-1990s work, but I’m getting the impression it was mostly voice/text based cut-up work, heavy on the distortion, and with something of an “industrial” undercurrent. There’s certainly something a tad foreboding about a record called A Soundless Message of Death, but that was in 1984 when such weighty matters were occupying the minds of many neurotics. They’re here today in a new-ish incarnation, appearing as Strafe F.R., and joining forces with a female vocalist named Caterina De Re. On The Bird Was Stolen (TOUCH TO:110), their first release since their 2014 “comeback” album Sulphur Spring, you can enjoy 14 examples of their studio craft. Evidently they have become highly proficient with digital technique and evolved their edgy, alarming musique-concrète style into the area of avant-techno and deep-dark ambient, all undertaken on their own highly individual terms of course, to produce some deeply ugly and unsettling abstract noise episodes. The voice elements are distorted and transmutated into all sorts of new and terrifying shapes, extreme enough to give Henri Chopin permanent cardiac arrest; in places it’s only barely possible to recognise a human being’s larynx at work. The more alarming cuts are front-loaded at the start of the CD; ‘Aconite’ for instance, is like hearing absurdist poetry recited by merciless robots from the future, while on ‘Anophleis’ the voice of Caterina De Re is remade by extreme studio digital-malarkey into some grotesque evil hybrid of Bjork and Clare Grogan, swimming for dear life in a vat of green acid. Other tracks, like the highly evocative ‘Golden Stomach’, seem to downplay the voice components in favour of contemporary industrial noise-experimentation, scads of digital delay and reverb, and mysterious instrumental passages floating in among the heavy hammer-blows of percussive sounds. So far this is like an update on H.N.A.S. – it’s got the same streak of cruelty and sardonic absurdity, and a Dadaist touch of mischief that makes the creators want to poison every sound they touch, infecting it with unnatural cancers and shape-shifting properties.